Celebrating Our 50th Year in Business! 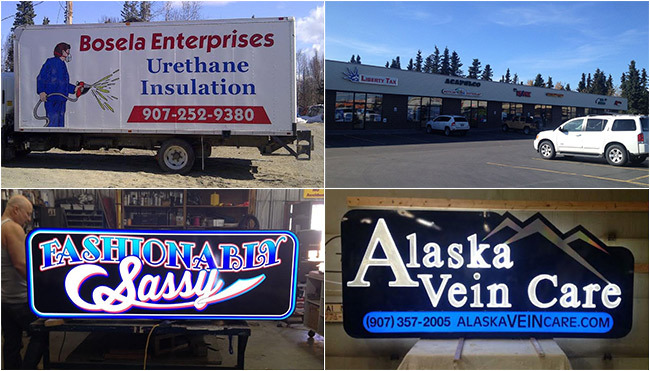 For all of your custom signage needs, choose Kenai Neon Sign Co. For over five decades, we have been creating beautiful signs and decals for customers throughout Alaska. From sign creation through installation and even maintenance and removal, we’re the company to call. While Kenai Neon Sign Company officially opened its doors in 1968, its founder, Mr. Bill Field, had been making sign since 1948. From the start, the company was a modest venture with great ambitions. At first, Kenai Neon Sign Co only had a sheet metal brake and a boom truck. However, Bill was determined to use his experience in the industry to ensure the success of Kenai Neon Sign Co. Over the years he worked tirelessly to grow the company from a one-man shop to a premier sign shop on the Kenai Peninsula. This hard work paid off and the company continued to expand. We create beautiful, custom signs and decals. We are a member of the International Sign Association and The United States Sign Council. We invest in continuing education and training for our technicians to stay cutting edge. We bring decades of experience to the industry. Our membership as a UL company reflects our commitment to high quality.